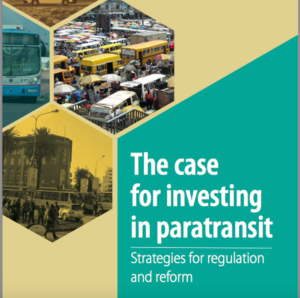 “The case for investing in paratransit: strategies for regulation and reform” summarizes, updates and presents the main messages in the book publication Paratransit in African Cities: operations, regulation and reform, edited by Roger Behrens, Dorothy McCormick and David Mfinanga (Routledge, 2016). The synthesis was produced by Gail Jennings and Roger Behrens (University of Cape Town), in cooperation with the Volvo Research & Educational Foundations. We encourage readers to refer to the book publication for greater detail on the issues discussed in this synthesis. This publication is also available in French, Le cas de l’investissement dans le transport à la demande: Stratégies en termes de réglementation et de réforme, and in Portuguese. The authors wish to thank the Volvo Research and Educational Foundations (VREF, www.vref.se) for the generous funding awarded to the Universities of Cape Town, Dar es Salaam and Nairobi to initiate the research projects which formed the basis of this research. These research projects formed part of a broader research programme conducted by the African Centre of Excellence for Studies in Public and Non-motorised Transport (ACET, www.acet.uct.ac.za).